(WOMENSENEWS)—Last week a Texas police officer was fired for excessive brutality after a video showed him body slamming a 12-year-old girl, in her classroom, to the ground. The disturbing scene was eerily reminiscent of another video that captured the brutal arrest, last October, of a girl in a South Carolina school. In that case, an officer tossed the student across the room before violently restraining her. In both instances, the officers using excessive force were men. Sandwiched in between these incidents were two others, involving female officers. Last October, one of those officers diffused a street fight in Washington, D.C., by engaging in a dance off. In February, a Dallas police officer stopped an active shooter who had opened fire in a busy Wal-Mart. The officer, a woman, did not fire a weapon, but chased the shooter, demanding verbally he stop shooting. Female officers discharge their weapons at far lower rates and are more effective at negotiating better and less lethal outcomes, even though citizens are not more likely to use less force when officers are female. In 2002, the National Center for Women in Policing completed a landmark study that revealed marked differences in policing based on gender. It found male officers, who make up 88 percent of the U.S. police force, are eight and a half times more likely than female officers to face sustained charges of excessive force and to discharge their weapons, which is clear from the four cases previously cited. In the years since that study was published, during which time the number of women on police forces has barely changed, follow up studies, both national and international, have repeatedly confirmed these findings. Ignoring the role gender plays in police brutality is impairing efforts to properly frame problems and find solutions. In an effort, perhaps, to paint a picture emblematic of their findings, the Post focused its reporting on the death of an unarmed white man, David Kassick, who was shot to death in February 2015 by Pennsylvania Officer Lisa Mearkle, also white. Mearkle was acquitted of third-degree murder, manslaughter and involuntary manslaughter charges. Les Neri, the president of the Pennsylvania Fraternal Order of Police, warned that cases like this one, which included video evidence and was an example of the debated “YouTube effect,” demonstrate the dangers of “criminalizing judgment errors” and cobbling law enforcement’s ability to do their work. “Judgment errors,” however, are not evenly distributed in police forces. Women are also more likely to make distinctions between physical force and institutional power, between themselves as individuals and as officers. Because they can’t so readily and don’t so quickly use force, women are more likely to use other tools to resolve conflict. Male officers are more likely to feel personally challenged in volatile situations, while women, for whom violence is not so salient to gender identity, don’t. Masculinity, in policing as elsewhere, is a “dynamic risk factor” in the possibility of escalating violence and excessive force. Additionally, female officers tend to treat women’s complaints differently. They are more likely to pursue cases involving intimate partner violence against women, which make up, according to the police, up to 40 percent of calls made to their departments. Law enforcement officials have been aware of the positive impacts of increasing the number of women in police forces for decades, and yet tokenism and the persistent idea that policing – defined as authoritarian, violent, physically demanding – is men’s work remains a serious obstacle to women in policing. Breaking the brass ceiling has proved exceedingly difficult. In 2013, the last year that counts are available, only 219 women filled senior policing positions in more than 14,000 U.S. police departments. Women still make up only 3 percent of police chiefs in the United States. All told, women, on average, make up a stagnating 12 percent of police forces, yet only 6 percent of the substantial funds required to pay court judgments and settlements for excessive force involve female officers. 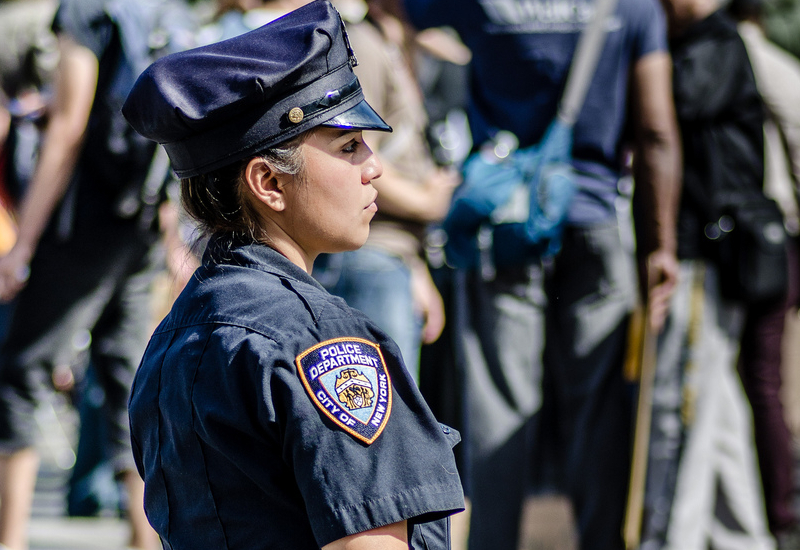 The minority status and marginalization of women in police departments is part of a larger issue of diversity, implicit bias and community relations. In many communities, the percentage of minorities on police forces is more than 30 percentage points lower than the populations they serve, but numbers are improving. Among men, those belonging to minorities now make up 27 percent of U.S. law enforcement, compared to 15 percent in 1987. However, the numbers of women joining law enforcement appear, after a period of growth (from 5 percent in 1987 to 12 percent today) to be stagnant or declining. Black women are the least likely to be represented as members of local law enforcement. At the same time, black women are “over policed and under protected,” a national phenomenon that was thoroughly documented last year in a study conducted by the African American Policy Forum and the Center for Intersectionality and Social Policy Studies. In January of this year, during testimony about “culture and diversity” made before the Presidential Task Force on 21st Century Policing, Chief Barbara O’Connor, president of The National Association of Women Law Enforcement Executives, suggested a range of approaches to reduce police brutality and misconduct that included, but were not limited to, improving recruitment and retention of women. Female officers face sexism, discrimination and sexual harassment. Their burnout rates are higher. If they pursue charges of sexual harassment or gender discrimination, they risk retaliation, similar to the risks encountered by women who bring charges against husbands who are police officers. Like women in other sectors, their careers are hindered by lack of maternity and child care provisions and by male resistance to opportunities at senior levels. Despite access and exposure to well-understood data and workplace realities, as O’Connor pointed out, departments are tenaciously ignoring them. Many departments fail to even have clear objectives for recruiting and retaining women and men of color. In one jurisdiction O’Connor described, newly proposed physical testing standards would mean that 82 percent of current female officers would fail entry tests for a job that desperately requires the skills they have. Until gender and intersectionality are taken seriously by law enforcement institutions, as critical tools for understanding violent shootings, killings and other abuses perpetrated and tolerated by the police will continue. If we are coming to more deeply confront the ways in which abusive and authoritarian policing culture developed in the context of historical systemic racism, then we must understand that it indivisibly, simultaneously, also developed in the context of historical sexual discrimination and gender violence. Soraya Chemaly is a writer whose work focuses on the role of gender in culture. Her work appears in Salon, The Atlantic, The Guardian, Huffington Post and The Nation. Chemaly is also the director of the Women’s Media Center Speech Project. You can find her on Twitter at @schemaly and on Facebook. Yea, Instead of one guy it will only take 2 women to do the exact same job of apprehending a criminal. That’s a great idea for an already overwhelmed police force. obviously did not read the article. The article was just platitudes and anecdotes. No real data.